A NORTH AMERICAN volcano erupted this morning prompting a passing commercial jet to move in for a closer look. Passenger Colt Snapp took a truly impressive image of the erupting Pavlof Volcano on his flight from Dutch Harbor to the the city of Anchorage in the remote US state. According to Snapp, the pilot of the PenAir flight did his best to move the plane closer to the eruption to give his passengers the best view possible. The volcano, situated on Alaska’s Aleutian Islands, erupted at about 4pm local time yesterday. 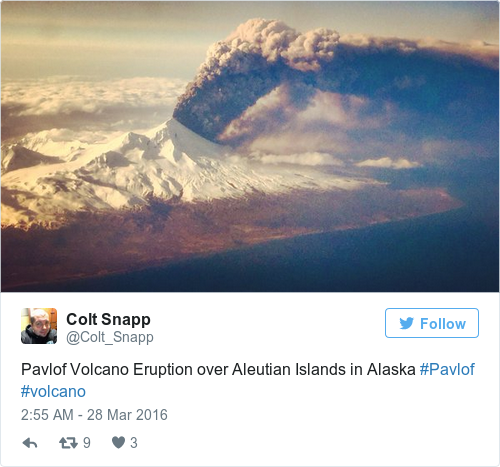 Eruptions on Pavlof are not uncommon – the mountain, situated about 600 miles southwest of Anchorage, was last active in November 2014. @JenniferNewton1, nope no delays or problems, pilot made purpose to get as close as possible to let everyone get great look at it. Pavlof's eruption plume, 4:58 pm March 27, 2016. Photo courtesy of Nikita Robinson. The nearest settlement to the volcano is a town called Cold Bay, located about 40 miles to the mountain’s south. The US Geological Survey had raised the aviation colour code for the region to ‘red’ in the aftermath of the eruption. That has since been dialled down to ‘orange’. “There are no reports of ash falling in nearby communities,” the Survey said in a statement. Email “Commercial pilot flies closer to erupting volcano to give passengers a better look”. Feedback on “Commercial pilot flies closer to erupting volcano to give passengers a better look”.